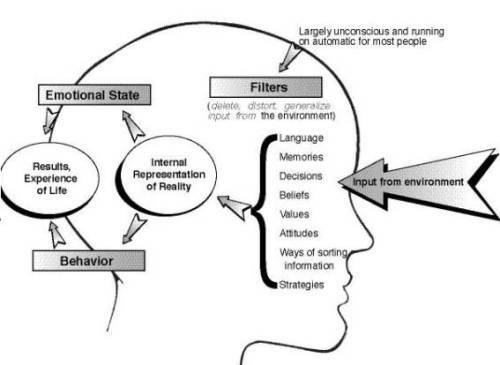 Here’s how the filtering mechanisms affect how your internal map of reality operates to generate your feelings, thoughts, and behaviours. Sensory input, as it comes in, is filtered in some way, through a fairly large filtering mechanism. This filtering mechanism makes up a significant part of your internal map of reality. Some of these filters include your beliefs, values, memories, decisions, the language you speak, methods you have developed for sorting, storing, and retrieving information, your strategies for making decisions, and a few other things. These filters do three main things. They delete, distort, and generalize. Though they do all of these things simultaneously, let’s look at them one at a time. These filters delete some of the information. There’s just too much coming at you all the time, and a whole lot of it you just don’t notice—you immediately delete it, you disregard it. As you walk through a room, there are an infinite number of details that hit your eye, but you don’t notice them all. You don’t notice every spot on the carpet, every scratch on the furniture, every whorl in the wallpaper, every item in the room, and so on. And the same thing could be said for smells, sounds, physical sensations, and so on. When we talk about ideas coming at you, for instance, or evidence coming at you that you might take into account when deciding what to believe, what to do, who to be attracted to, how to make a decision, or something like that, we tend to delete whatever does not agree with our current beliefs, values, and so on. Something would have to be huge and right in your face, and also, at the same time, be contrary to what you believe, in order to override your tendency to automatically delete those things that don’t agree with your beliefs. The second thing these filters do is distort what comes in. There are many ways this could happen, but the one that’s pertinent here is that we distort what comes in, again, so that it verifies what we already believe and value, what we’ve already decided, and so on. We take the part of what’s coming in that agrees, and keep it, and take the parts that don’t agree, and get rid of them, and in this way, we distort the pure input we receive. Or, we might add something that really isn’t there, and distort it in that way, or create some other misperception that distorts what’s coming in so that it conforms to the parameters of our current map of reality. Here’s an example. If you believe that no one will ever love you, and someone turns you down when you ask them for a date, you might see that as evidence that you are, indeed, unlovable, even if the real reason was that the person was already in a committed relationship, or had another commitment that night, or you just weren’t their type. You’ll either leave out some of the evidence, or add something to it, in order to distort what’s happened and make it agree with your belief. The third thing these filters do is to generalize. Generalizing is not necessarily a bad thing—in fact none of these three results of the filtering process are necessarily bad, as long as you do them consciously, as long as you know you’re doing them, and have some reason for doing them, and you’re doing it because it gives you a particular result you want. If we didn’t make generalizations, we would have to re-learn what a door was and how to open it every time we came to one. Generalizations can be a bad thing, though, when they cause us to not see the differences that make something unique, and, because of that, assume that it’s exactly the same as something else that’s in the same general class, but has some significant differences. Let’s say someone you were in a relationship with cheated you. They stole money from you and left. If you generalize that to mean "all men will steal from me" or "all men will take advantage of me," and assume that just because other men share the same gender with the jerk who stole from you, they’re also the same in other respects, including being dishonest and unreliable, you won’t be seeing things clearly and realistically, and might do something to create an outcome you don’t want. One clue that generalizations are being made is when you hear words like "all, never, always, no one, everyone"—global words. So these filters delete, distort, and generalize the input as it comes in, and after that happens, what you perceive is not the pure input that initially came in through your senses. You perceive a filtered version, and that filtered version may or may not serve you and contribute to you getting what you want in life. Next, what happens is that you make some sort of an internal representation of the results of this filtering process. In other words, you make an internal representation of things you see, as an internal picture, what you hear, as an internal sound, and so on. Again, this goes on automatically, very rapidly, and almost always unconsciously. The filtering mechanisms, and the whole process of making internal representations, and the resulting states and behaviours, pretty much happens unconsciously and automatically. Your ways of filtering—which, remember, include beliefs and values and all the other things I listed—and your ways of making, storing, remembering, and retrieving internal representations, ultimately create all the nuances of your life and how you experience it. Please Note: This presentation draws heavily on and fully acknowledges the work of Bill Harris of Centerpointe Research Institute in his "Life Principles Course"